Approach: From the hut follow the path into the cirque. From there continue southe towards the glacier and head towards the obvious slabs of the Kleinkalter straight ahaid of you. 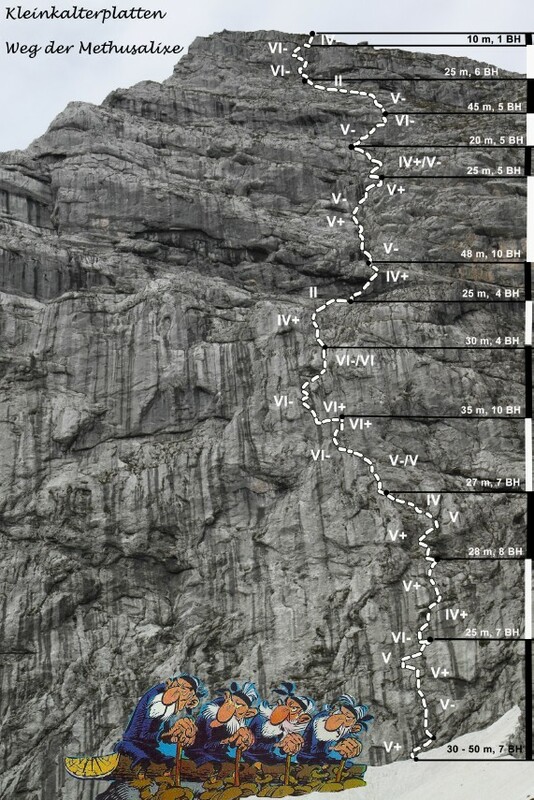 Some easy scrambling (grade I – II) takes you to the foot of the wall. About 45 – 50 minutes. 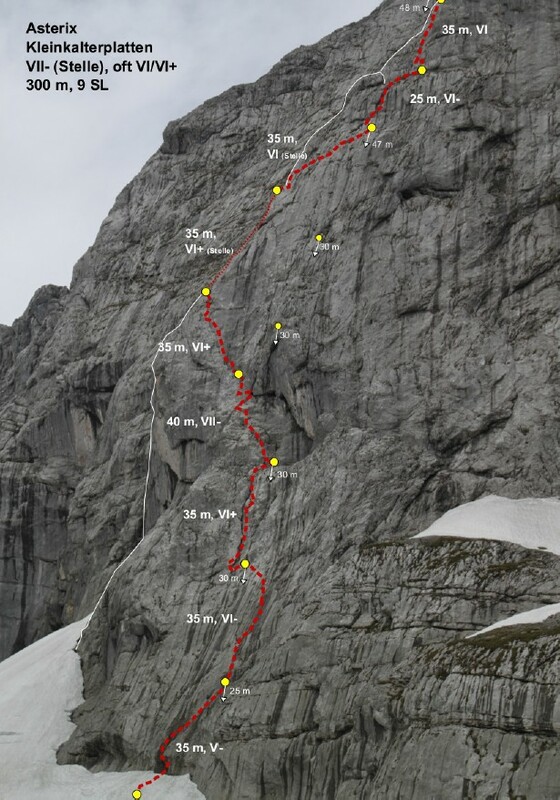 As an alternative: at the exit of the route follow the ridge for about 150-200 meters in elevation. You eventually reach the normal route of the Hochkalter. This will take you in 1 to 1.5 hours back to the Blaueishütte. Approach: From the hut follow the trail towards the glacier (rather perennial snow field by now). When trails branch off to the left towards Kleinkalter and Schärtenspitze, continue straight and climb towards the glacier. After passing the Rotpalfen on your right hand side, follow an obvious and steep snow or debris field until you can exit to your left onto a vegetated ledge. Follow the ledge to a large Block and continue to your right up a snow or debris field. Protection: completely bolted, Friend #3 useful for the large flake. Descent: Continue uphill about 5 minutes until you reach some huge blocks. Traverse out to the right to the normal route to the Hochkalter. Return to the hut in 1 – 1.15 hours.